You may have noticed that I left out any mention of a dessert in my Valentine’s Day post. But no Valentine’s Day (or any other holiday—or most weekdays, for that matter) would be complete without a dessert, preferably something chocolatey. And this month’s Daring Bakers challenge filled that need admirably. 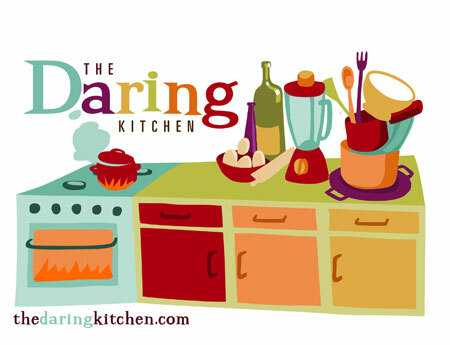 The February 2009 challenge is hosted by Wendy of WMPE’s blog and Dharm of Dad ~ Baker & Chef. We have chosen a Chocolate Valentino cake by Chef Wan; a Vanilla Ice Cream recipe from Dharm and a Vanilla Ice Cream recipe from Wendy as the challenge. 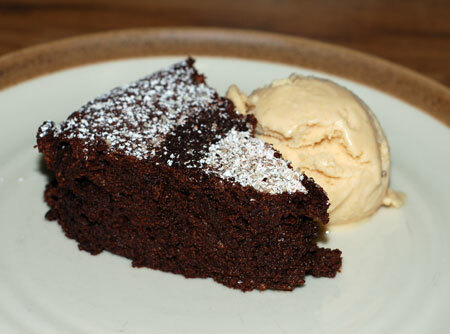 Decadent chocolate cake and ice cream—who could ask for more? For me, the most difficult part of the challenge was acquiring a good quality chocolate on a shoestring budget. Although most of the time I am content to use bittersweet Ghirardelli bars from the grocery store, I was determined (in the spirit of the challenge, of course) to try out a brand we’d never eaten before. Chocosphere carries more options than I could shake a stick at, but I went with Valrhona Le Noir Gastronomie, a 61% bittersweet. I decided against a higher cocoa content because I was concerned about bitterness, considering the lack of sugar in this recipe. The 1Kg bag of fèves I purchased was more expensive than I would have liked, but on the plus side, I now have just over a pound of excellent chocolate leftover for another recipe. The cake itself was incredibly easy to make. I went my usual route and melted the chocolate and butter in the microwave, and then it was just a matter of stirring in the yolks and folding in the beaten whites. I was stumped at first by the 50 sq. in. pan requirement, because I don’t have any springforms or cake pans smaller than 9×9, a deficiency I will someday have to rectify. But after taking my tape measure to every dish in the kitchen, I went with a small ceramic casserole of about 6×9, and couldn’t resist saving a bit of batter for my lone heart-shaped ramekin. The casserole went in for 25 minutes, and the ramekin joined it after the first 10. They both turned out beautifully, and I had no problems with sticking. I decorated the heart with a simple cloud of powdered sugar, and attempted a stencil on the larger valentino that also incorporated cocoa powder. As for the ice cream element of the challenge, I’ve tried countless ice cream recipes since receiving an ice cream maker a year or two ago, more than one of which was a variety of vanilla. And I was out of heavy cream. So I took the liberty of making peanut butter frozen yogurt instead, adapted freely from several recipes in The Perfect Scoop . It turned out very well, and beyond the obvious perfections of the chocolate-peanut butter pairing, the sweet tang of the yogurt proved a good counterpoint to the bittersweet chocolate. Too bad Nolan isn’t quite old enough yet to sample peanuts. All in all, this was one of the more straightforward challenges, and I have to admit it was a welcome one. The cake really does showcase the chocolate you choose. 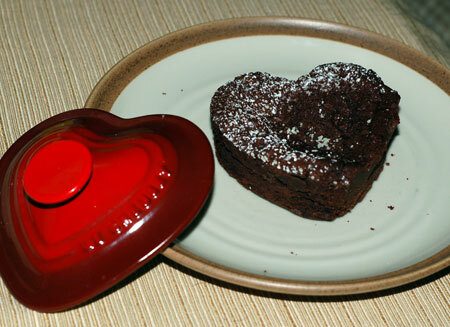 The texture is a bit like crumbly velvet at room temperature, and reheats to fudgy decadence with just a few seconds in the microwave, a perfect Valentine’s dessert that lasted us several days. Thanks so much to Dharm and Wendy for choosing this month’s challenge, and check out all the other chocolate valentinos at the Daring Bakers Blogroll. 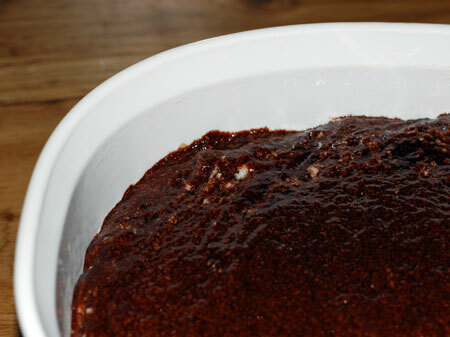 Combine all ingredients in a blender, and process until homogenous. Chill in the refrigerator for several hours or overnight, then churn in an ice cream maker according to the manufacturer’s instructions. Love the peanut butter frozen yogurt! A slightly tangy take on good ‘ole chocolate and peanut butter. Great job, and it all looks lovely! Very well done! Your cake and ice cream look mighty scrumptious! What a lovely job you’ve done with the challenge. I love the addition of the peanut butter frozen yogurt and will have to give that a try. Oh, your cake looks lovely! I will have to try the peanut butter yogurt. That sounds yummy. I love that you made frozen yogurt! Everything looks scrumptious. 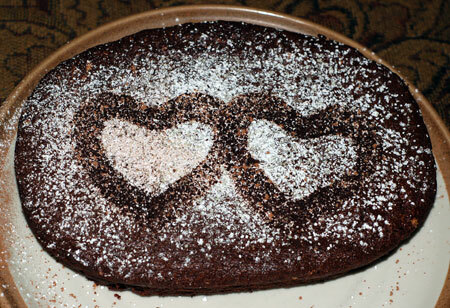 Your cake looks great (I especially love the little heart shaped one). Peanut butter frozen yogurt would be the perfect accompaniment– who doesn’t love PB and chocolate together? The froyo idea does sound like a nice contrast to the richness of the cake. Great job.